Did you say cheese? We're not talking Velveeta. LuxEcoLiving caught these cheese celebrities free ranging. Did someone say cheese? Did you say cheese? We're not talking Velveeta. Although, let me say that was my first non- real cheese experience. Back then, pasteurized cows milk produced thin sliced squares of something orange in color. All moms made us eat them thinking they would build strong bones. They slathered mustard and mayo between two pieces of white bread and called it a cheese sandwich. Four little squares, soft and sometimes mushy (around noon), with a carton of milk was considered a healthy lunch. Or how about a melted cheese sandwich before we had the Panini press. Remember your first recipe that your mom taught you? Using two thick slices of Velveeta fried in a pan with plenty of butter. Back then nobody was counting their colesterol. Well, Daisy cow, Emily goat, and Billie Barb sheep have come a long way -- from pastures to curds, some stinky, bloomy, soft, hard, wet, wine soaked and olive oil rubbed... our girls have been busy making the most delicious, (consumptuous) lactose intolerant cheeses... some are even proprietary recipes, caved aged by masters who are meticulous about the finite details of refining their cheeses. The experience of dining on cheese with a few good friends is a totally delectable, even sensual experience. And what I love is the totally unique experience -- the experience of tasting cheese brings to the party. Two of the best cheese stores in the world are Venissimo of California with four locations. And if you are a really serious cheesemonger, head to Murray's of New York. Here are my favorite pics. From Venissimo you have to try the Moliterno -- MOL-LEE-TEAR-NO. First you have to learn how to pronounce it. And if you love the taste of truffles try the Basilicata (Italy), which is veined with the precious and luxurious truffles then rubbed with olive oil. Gina recommends all the pairings and suggests a Barbera Amontillado. Don't miss the dense and intense, fruity and nutty taste of the Pico-Affine from Perigord France. Picoaffine from Venissimo. Best served with a French Bordeaux or White Burgundy. Here are the pairings Gina sent: Do not miss the Harvest Song walnuts from Armenia, and serve them with the blue cheeses. Also, the salted pistacho honey from Texas which is a signature of Venissimo. From Murray's of New York you have to try the Challerhocker-Swiss Cheese. Pair this with a crisp Chablis. Next, the Barden Blue Bardwell farms is a blue cheese known to convert blue cheese haters into cheesemongers. The one cheese from Murray's you will continue to crave long after the last lick off the plate is the Hudson Flower -- a Murray's exclusive form upstate. A round of fresh, uncased kinderhook Creek -- crafted at Old Chatam Sheeperdine Company. 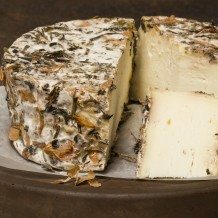 The Hudson Flower is an exclusive propriatary blend of rosemary, lemon and thyme made from organic sheeps milk. Blanc Blue Tambor is a wonderful raw goats cheese imparts a clean but complex flavor. Here are some wonderful pairings from Murray's.